Since EndSpace I've wanted to try a game that uses real planes, like F-16 or F-22 or something. 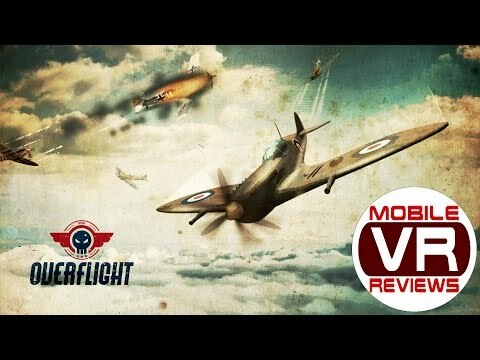 Overflight gets pretty close: it's a multiplayer only WW2-era dogfighting "sim". Only one map, and the map is pretty bland, no upgrades or customization, no single player missions (although bots are available). But it's in a cockpit and you can look around. I've been waiting for something like this, and... I played it for about 20 minutes tonight in total, including a short break. That's literally all I could take without throwing up. I'm not especially sensitive to motion sickness (I feel it just a little in EndSpace and Omega Agent) but this game really hits me, especially if you have to circle more than once to find your target. It's not as bad as the GearVR roller coasters, but it gets close sometimes. I'll keep trying it. I can see how it might appeal to some, I definitely haven't fully explored the game. If you have a really strong VR stomach, it might be a lot of fun. Ive been wanting to try a flight sim with free look! And i do have a hard stomach for vr. Thanks for posting. @obi2kenobi I agree. Overflight doesn't make me motion sick either. The first time I played it was a little disorienting, but now it's perfect. I'm probably subconsciously doing what you recommend. However, I've had a very hard time with this game's multiplayer. It used to be really laggy and now I'm getting 'A Network Error Occured' whenever I try to play a game. It happens on WiFi and my cellular network. Every other game works fine online. Uninstall/reinstall didn't help. Is anyone else having connection issues? Glad i could help! The devs need to include that in game with instructions or something. I did have opponents all night last night too which is nice, but probably because it just came out...occy i didnt really have any bad network errors, but i did have an instance where it hung on start game and didnt load. Restarting the game seemed to fix it. Okay, i thought about maybe purchasing this game from just the advertisement and a few user ratings. However, after reading all of your fellow Sorcerers Professional opinion and Exclusive ratings, I'm sold! Next payment received i gotta acquire this Flight Sim! Used to play Microsoft Flight constantly and now with recent Gear VR purchase, my list of PC and Laptops are really not getting the use they used to. Now there more for work and Gear VR is definatly top of my play time now. Thanks for the honest and professional reviews, helped to finalize my decision! It's quite well done. Detailed cockpit, almost-sim controls, semi-realistic flight dynamics (I'll have a video review out next week). BUT: it is only 2, 3, or 4 player free-for-all deathmatch, human players and/or bots. No teams, no missions, one type of plane (but it's a Spitfire!). The deathmatch is done well, though. I was a just a little disappointed by the lack of depth. @obi2kenobi is right on the money with that statement! Not to mention the headset price of around 5 to 7 hundred dollars USD. And that doesn't include the VR ready tower at around 2 to 3 thousand USD... well you can skate by with paying less then a thousand for it on sale however not really if you want anything decent!!! Gotta say I'm happy that Samsung and Oculus poor VR in to the publics hands at an extremely price! And I'm satisfied, in fact it's one of the best investments I've made. Literally hours and hours of entertainment! @DaKaiHigh Agreed. For all its faults, the GearVR has provided an incredible amount of value.